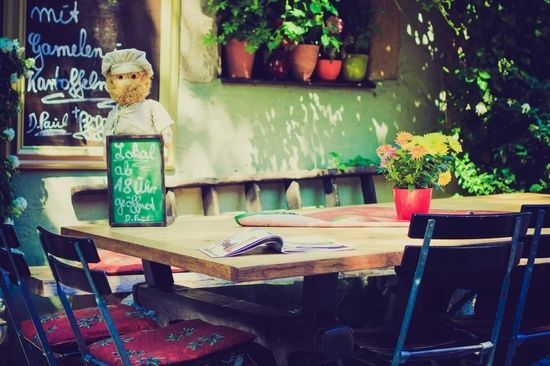 “I get way too much happiness from good food,” said the actress Elizabeth Olsen and we totally agree with her, especially when it comes to eating out in Bodrum. The whole peninsula boasts of top-notch chefs, atmospheric restaurants, and delectable food with sensational tastes. Including the smaller coastal resorts as well as the main town centre, restaurants provide a wide choice of international and Turkish cuisine. Menus bursting with starters, main courses and sweet puddings vary in price, but the average cost of eating out in Bodrum is 60 lira per person for a middle range meal. If you are on a budget, head to the traditional Turkish lokantas to pay only roughly 20 lira per person. These basic restaurants do not offer the razzle and dazzle of the Bodrum social scene but serve an impressive array of delicious Turkish cuisine to satisfy the palette. Here at Turkey Homes, we visit traditional lokantas if we want a quick, basic meal but at night-time, love to sample other restaurants known for their individuality. Whether it is the décor and atmosphere that grabs us, or their house specials, eating out in Bodrum is a pleasant experience that easily becomes a regular habit. Therefore, what are our favourite restaurants for a special night out? Bodrum’s regional summer tradition is Aegean dining focusing purely on freshly caught seafood and fish. Aegean dining is more of an experience rather than just a meal. The meal should be slow, relaxed, include good company and light hearted conversation sometimes lasting three or more hours. Nibbling on traditional Turkish mezes before the main fish dish is served; the accompanying drink is Raki to compliment the fish with its aniseed taste. To indulge in this delightful experience, we always head to Melengec restaurant in Gumusluk. The seaside setting is perfect for couples, and groups of friends, while their service is of high quality. Menu prices are higher than other fish restaurants, but we love the décor of blue and white, typically reflecting Bodrum’s relaxed ambience. Melengec also enjoys fame as a favourite hangout for the rich and famous Istanbulites holidaying in the Bodrum peninsula. Our favourite dishes to indulge in are the king prawns, calamari, octopus salad and a simple sea bream. On the odd occasion, we feel like splashing the cash by heading to the fine dining restaurants of Bodrum. The Marina Yacht Club has an award-winning chef, offering signature dishes. Naturally, as a seaside restaurant, fish dishes are plentiful, but their pasta creations win our admiration. The indoor seating fills up quickly, but in summer, much like everyone else, we prefer their rooftop terrace outside so we can enjoy a pleasant al fresco dining experience. They also host a busy entertainment program with live music. 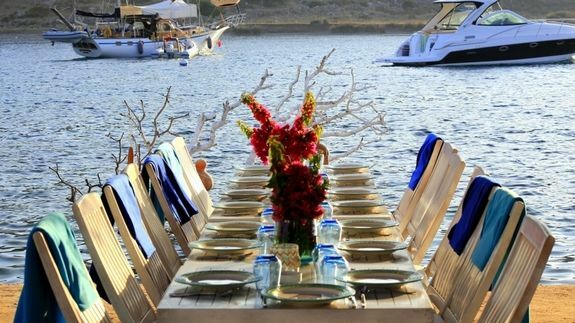 Another fine dining restaurant of Bodrum that hosts international celebrities is Secret Garden, the brainchild of Jade Jagger. Attached to the Halicarnassus nightclub, the award-winning chef excels in signature dishes with creations such as salmon tartare with soft poached quail egg, or roasted sea scallops with pan-fried duck liver and aubergine caviar. Further, out of Bodrum town centre, into the peninsula, Yalikavak marina hosts well-known establishments such as Sait, and Nobu, but meat lovers should head to Nusr-et Steakhouse. It is pricey but worth it for delicious feasts such as smoked rib eye and the porterhouse steak. We are international food fans and love nothing better than to taste our way around the world. One of our favourite foreign cuisines is Chinese because of the variety in taste from hot, spicy to sweet, and sour. With indoor and outdoor seating, we always use Red Dragon in Bodrum town centre; although they also have franchise restaurants in the smaller Bodrum holiday resorts of Gumbet and Bitez. It is one of the few places in Bodrum to serve sushi, and their daytime set menu is incredibly cheap at just 15, 50 lira. If you are in the Ortakent district of Bodrum, also drop into the Chinese Inn in Midtown Shopping Centre for an all you can eat buffet between 12 noon and 2 pm for just 23 lira. Turks typically do brunch on the weekends, but we think every day is good for a mid-morning feast. 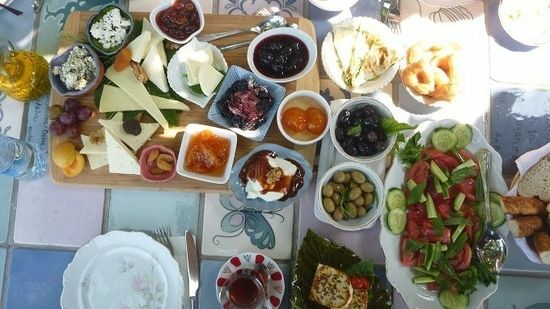 Brunch in Turkey is usually a broader concept of the traditional breakfast. Basic egg dishes are included, but variety works its way through the choices of cheese, olives, jams, honey, and pastries. Havva in the old Gokcebel district of Yalikavak is a favourite of Turks and us. The stone terrace set in among a green landscape of plants, flowers and the odd wandering chicken has roughly 25 tables. There is no menu, but as soon as you are seated, homemade and organic dishes are served in the middle for everyone to eat at their leisure. Victoria’s is also a good place for brunch, especially if you have kids who will love the horse-riding stables and a large swimming pool. Its beachfront location is another bonus. The laidback ambience and vibes of Victoria’s top off a laidback brunch perfectly. Further Reading: Do you want to know more about the Bodrum peninsula of Turkey? If so, our blog articles include things to do, places to go, reasons why foreigners buy property there and much more. If you are looking to buy property in Bodrum, contact us to receive a selection from our portfolio of apartments and villas for sale.